Here’re the people who helped us in getting our house built – the architect, builder, vendors for the reused material. Architect. We got Maya Praxis, an award-winning architect firm, to design our house. Vijay Narnapatti and Dimple Mittal translated our wacky ideas into designs, and added a whole lot of wacky ideas of their own. We totally love what they’ve done for us ! Bamboo corrugated sheet roof: Timpack Pvt. Ltd., Byrnihat, Meghalaya. Builder : Vismaya Interiors. They goofed up on a lot of things, and there’s zero warranty on their work. Rain water harvesting system: Great Bear Promotions, Bangalore. The rain water system started coming apart after some months, and the sump leaked. Got no remedy from them. 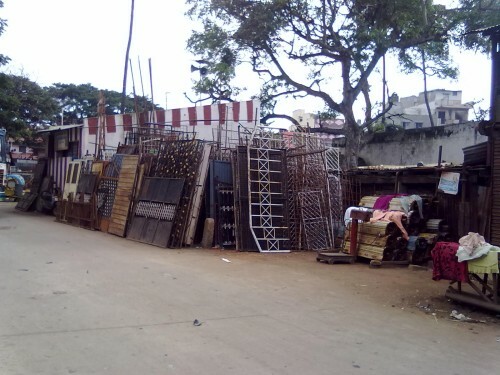 Bangalore has a large demolition industry. Specialist demolition firms break down old buildings and sell the wood and other reusable material in the building through their shops. You will find these shops all over the city, but the heaviest concentrations are in Shivajinagar and City Market – both places coincidentally called Bamboo Bazaar. Pine wood from packing cases : A whole lot of shops in Bamboo Bazaar, Shivajinagar. Glass : Munaaf can source used glass for you from demolished buildings, and also does lovely glass painting and glass frosting. The dining table in the hall was painted by him. He has a factory in Shivajinagar. 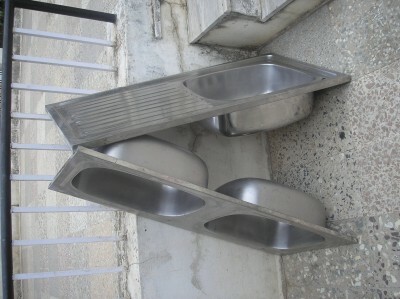 Kitchen sinks : Ahmed has a whole range of used stainless steel sinks, from demolished homes and restaurants. He has a shop in Sunday Market (only open on Sundays) at the end of BVK Iyengar Rd., near the City Market flyover. 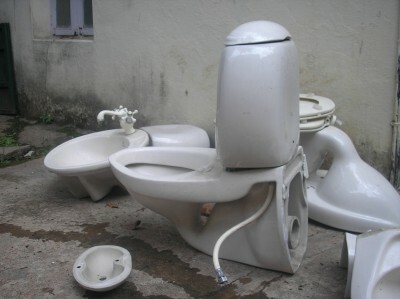 Toilet fittings – commodes etc. 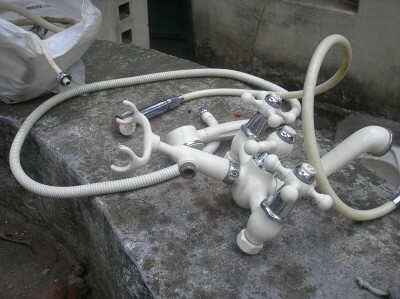 : We got our used commodes, wash basins and plumbing (taps and showers) from Akram in Bamboo Bazaar, City Market. Door and window frames : Lots of shops in the two Bamboo bazaars, and others dotted around the city. Floor tiles : You can sometimes get unbelievable deals on these. Ceramic tiles are used for the flooring in booths in exhibitions, and are useless after the exhibition is over. I once saw a whole bunch of them from the Air show, selling at the absurd price of Re. 2 each (new ones would have cost Rs. 30 each). Tiles are useless if they are pasted to cement at the bottom, but this lot were just laid on sand. Tiles from old buildings too are sometimes usable because they are laid on lime mortar which comes off easily. Granite slabs : Granite slabs on a lot of footpaths around the city are being replaced with tiles. You can strike a deal with the contractor right where the work is being done, and get them very cheap. He does not have to spend money carting them to some other place, so you save this money too. Basically just scrounge around – you never know what you’ll find. 1. After the design of the house is ready, make a list of what you need and what type. E.g., the quantity, type and size of kitchen sinks, wash basins, etc. 2. Keep going periodically to the demolition material markets, pick up whatever you can get and store them away in your place. Remember that they may actually be used only after many months. 3. Give a list of the stuff you need to any vendors you think are suitable, with your phone number. Ask them to call you when they get anything on your list. 4. If you see a building being broken down anywhere and see some useful stuff, strike a deal with the demolition contractor right there and cart the stuff away. He saves on transport to his shop, so he’ll pass on this benefit to you. 4. The price you pay for anything should be approx. 20 % of the same thing new. I would love to do all this; doing a bit alreay and also segregating waste at home, in our colony and now getting to work with the Municipality to make it applicable city wide. lets connect. Which city is that ? Used pine wood (and other wood too) : Bamboo bazaar near Cantonment station. Also in Vijayananar, but don’t know the exact location here. Carpenters : I don’t know, but I guess it’s better to get people who live nearby. I am greatly impressed … looking at starting construction -low cost , eco friendly ideas -need your suggestions. Thank you. Will email you my phone number and email ID. can give you suggestions on phone, or you can come over and see the house sometime. This is brilliant, very impressive. I am planning to construct house and follow your path of being eco friendly & of course cost effective (hoping I will be successful in sourcing materials), possible to connect with you for a dialogue to get even more clear direction please? Have emailed you my phone number. Please get in touch, and you’re welcome to come over and see my home. Thank you very much for this amazing webpage and an awesome initiative. I started all this research about six months back when i just started my construction in Kalkere, Bangalore. I wanted to reuse since I was on a tight budget. Luckily, your webpage came in very handy. All my window frames, MS railings etc came from the same bamboo market you mentioned. I am sure your contacts for Bathroom fittings etc are going to help as well. I wanted to get in touch with you and also invite you over. I will drop in my email ID. Was trying to get in touch with you. I wanted to get some details regarding the Cemented Flooring that you have done. Hi. Have emailed you my phone number. Hi Mr.Das, I have been construction my house in Hennur, I am very much interested to see your house. Would you be able to provide the address an your contact. May I please ave your contact number; would like to visit and also see how I can maximise my space. Been cheated by many “masons” and others, need to repair the damage in a low-carbon, low cost way! Can you please send us your contact and the suitable time for us to contact. I have just completed my new house. I must admit I am feeling dumb after seeing what you have done. Great work! Hope to meet u sometime. Come over some time and see the house. Might help in extensions or renovation. Hello Mr. Das. Thats a very beautiful house you have constructed. Im starting a cafe in Bangalore. I would like to use refurbished furniture and eco-friendly decor. Any idea where i can get used solid wood furniture? And also any ideas for the roofing? I’ll email you my phone number. Mr. Das, Thanks for such an informative write up. Bamboo corrugated roof sheets are made using formaldehyde resins. The formaldehyde resin in the sheet can emit carcinogenic gasses when subjected to heat. In a tropical country like India, that would be a huge concern. Have you thought about this? If so, I would love to get your opinion on it. Hi Mr. Das, You are a trend changer. I wish your ideas should be spread all over the world. This is an eye opener for the trending young youth generation. I am also a person who spend my free time in re-cycling old items and customizing those as a innovative interior for my house and sometime just to make my kids occupied and create interest to them to re-cycle, re-think and re-use anything and everything during their free time and make them think out of the box from their childhood. Thanks for being an inspiration to all of us. I would like to bring my kids and family to see your fabulous house during this summer holiday so that we plan similar things for my future eco friendly home construction in Yelagiri hill station. If you could share with us your contact details and address I would like to talk to you to seek your permission for a visit to your Mane. Thanking you in advance. Have emailed you my phone number.